Nestled in the Rogue River Valley in the quaint, charming town of Ashland, Oregon, the Ashland Springs Hotel is an oasis of tranquility and elegance. 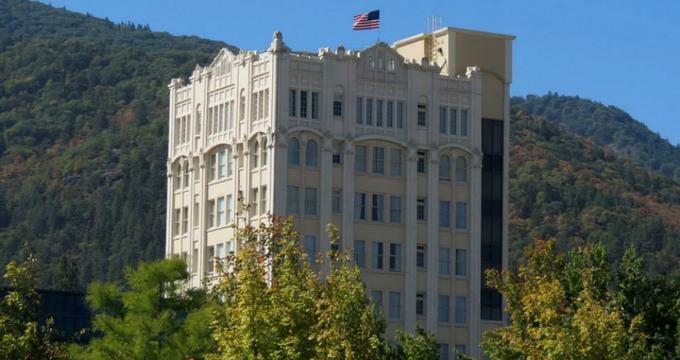 Built in 1925 and lovingly restored to its former glory, the Ashland Springs Hotel, a downtown landmark, exudes the style of small European hotels with luxurious accommodations, first-class facilities, and modern amenities. The Ashland Springs Hotel is ideally placed for exploring the area’s natural beauty and is an idyllic retreat for both business and leisure travelers. The hotel is located just a short way from the renowned Oregon Shakespeare Festival and other popular attractions, including winery and art gallery tours, fine dining and pampering at the nearby Waterstone Spa. There are also an array of outdoor activities on offer, such as hiking, biking, snowboarding, and day excursions to the Crater Lake National Park, Oregon Caves, and the California Redwoods. The Ashland Springs Hotel offers beautifully appointed guest rooms and suites, all comfortably furnished with contemporary décor, king, queen or double beds with pillow-top mattresses and plush linens, and private bathrooms with walk-in rain showers and deep soaking tubs. Spacious sitting areas have comfy sofas and seating, and modern amenities, including air-conditioning, flat-screen televisions with cable channels, mini-fridges, coffeemakers, iron and ironing boards, hairdryers and complimentary wireless Internet. Premium View King Rooms and View King Rooms are deluxe corner rooms with eclectic décor and custom furnishings and beautiful views of the surrounding mountains and downtown Ashland. The rooms feature king-size princess canopy beds with pillow-top mattresses, crisp linens and goose down comforters, and private bathrooms with walk-in rain showers and deep soaking tubs. Spacious sitting areas have comfy sofa beds and armchairs, and modern amenities, including air-conditioning, flat-screen televisions with cable channels, mini-fridges, coffeemakers, iron and ironing boards, hairdryers and complimentary wireless Internet. Traditional King Rooms are traditional European boutique-style rooms are located on the third and fourth floors with king-size beds with pillow-top mattresses, crisp linens and goose down comforters, and private bathrooms with walk-in rain showers and deep soaking tubs. Spacious sitting areas have custom furnishings, and modern amenities, including air-conditioning, flat-screen televisions with cable channels, mini-fridges, coffeemakers, iron and ironing boards, hairdryers and complimentary wireless Internet. Boutique Queen and View Queen Rooms are located in the third and fourth floors and feature European boutique style rooms, queen-size beds with pillow-top mattresses, crisp linens and goose down comforters, and private bathrooms with walk-in rain showers and deep soaking tubs. Modern amenities, including air-conditioning, flat-screen televisions with cable channels, mini-fridges, coffeemakers, iron and ironing boards, hairdryers and complimentary wireless Internet. Double Double and Queen Queen Rooms feature two double or queen beds with pillow-top mattresses, crisp linens and goose down comforters, and private bathrooms with walk-in rain showers and deep soaking tubs. Rooms are located on our third and fourth floors and have modern amenities, including air-conditioning, flat-screen televisions with cable channels, mini-fridges, coffeemakers, iron and ironing boards, hairdryers and complimentary wireless Internet. Parlor Suites are luxurious suites located on the third floor with beautifully appointed deluxe bedrooms with king-size beds with pillow-top mattresses, crisp linens and goose down comforters, and private bathrooms with walk-in rain showers and deep soaking tubs. Spacious sitting areas have comfy sofa beds and armchairs, and modern amenities, including air-conditioning, flat-screen televisions with cable channels, mini-fridges, coffeemakers, iron and ironing boards, hairdryers and complimentary wireless Internet. Larks Restaurant is the hotel’s on-site eatery which offers healthy, country-style cuisine created from locally sourced ingredients and served in a casual, relaxed environment. A complimentary breakfast is served in the dining room every morning and includes hot and cold dishes, fresh fruit platters, juices, coffee and tea. The Ashland Springs Hotel offers many excellent guest amenities, including an on-site restaurant, an exclusive spa, a fully-equipped business center with printing and copying services, and modern meeting and conference rooms with audiovisual equipment and complimentary wireless Internet. The hotel serves a complimentary breakfast and afternoon tea and cookies and also offers free parking and concierge services, a comfortable sitting area in the hotel lobby with a fireplace, and a beautiful English country garden. Dry cleaning and laundry services are offered from Monday through Friday. Ashland Springs Hotel features 5,700 square feet of function and meeting space across four unique rooms that can cater for groups of up to 200 people. The Grand Ballroom exudes the old-world charm of a bygone era and is attached to a palm-filled, Conservatory and English Garden - perfect for romantic occasions such as weddings, private and business functions, and other celebrations. The Courtyard Garden features a cobblestone floor with a wrought-iron gazebo, fountain, sundial, and trellises that boast an array of blossoming climbing roses, petunias, ferns, and ivy. The Courtyard Garden has tables, chairs, and decorative lighting, creating a charming outdoor setting for any special occasion.